In this study, we explore the competence of preservice teachers (n = 161) in labelling and creating new cross-sectional human diagrams, based on anatomy knowledge depicted in longitudinal sections. Using educational standards to assess visual literacy and ad hoc open questions, results indicate limited skills for both tasks. However, their competence is particularly poor creating diagrams, where shortcomings were observed not only in visual literacy but in content knowledge. We discuss the misconceptions detected during these assessments. Visual literacy training should be strengthened for these students, as it is a skill that is especially important for future teachers to use in learning, assessing, and reflecting on content in science education. This is particularly important in preservice teachers since they should be fluent in the use of visual teaching tools in teaching anatomy and other content in the biology curriculum. Ainsworth, S., Prain, V., & Tytler, R. (2011). Drawing to learn in science. Science, 333(6046), 1096–1097. doi: 10.1126/science.1204153. Avgerinou, M. D. (2009). Re-viewing visual literacy in the “bain d’images” era. TechTrends, 53(2), 28–34. doi: 10.1007/s11528-009-0264-z. Avargil, S., Herscovitz, O., & Dori, Y. J. (2012). Teaching thinking skills in context-based learning: teachers’ challenges and assessment knowledge. Journal of Science Education and Technology, 21, 207–225. doi: 10.1007/s10956-011-9302-7. Banet, E., & Núñez, F. (1997). Teaching and learning about human nutrition: a constructivist approach. International Journal of Science Education, 19(10), 1169–1194. doi: 10.1080/0950069970191005. Bergey, B. W., Cromley, J. G., & Newcombe, N. S. (2015). Teaching high school biology students to coordinate text and diagrams: relations with transfer, effort, and spatial skill. International Journal of Science Education, 37(15), 2476–2502. doi: 10.1080/09500693.2015.1082672. Boesdorfer, S., Lorsbach, A., & Morey, M. (2011). Using a vicarious learning event to create a conceptual change in preservice teachers’ understandings of the seasons. Electronic Journal of Science Education, 15(1) Retrieved from http://ejse.southwestern.edu/article/view/7381. Butler, J., Simmie, G. M., & O’Grady, A. (2015). An investigation into the prevalence of ecological misconceptions in upper secondary students and implications for pre-service teacher education. European Journal of Teacher Education, 38(3), 300–319. doi: 10.1080/02619768.2014.943394. Canham, M., & Hegarty, M. (2010). Effects of knowledge and display design on comprehension of complex graphics. Learning and Instruction, 20, 155–166. doi: 10.1016/j.learninstruc.2009.02.014. Carvalho, G. S., Silva, R., & Clément, P. (2007). Historical analysis of Portuguese primary school textbooks (1920–2005) on the topic of digestion. International Journal of Science Education, 29(2), 173–193. doi: 10.1080/09500690600739340. Cheng, Y. L., & Mix, K. S. (2014). Spatial training improves children’s mathematics ability. Journal of Cognition and Development, 15(1), 2–11. doi: 10.1080/15248372.2012.725186. Coleman, C. (2011). Teaching health care professionals about health literacy: a review of the literature. Nursing Outlook, 59(2), 70–78. doi: 10.1016/j.outlook.2010.12.004. Constable, H., Campbell, B., & Brown, R. (1988). Sectional drawings from science textbooks: an experimental investigation into pupils’ understanding. British Journal of Educational Psychology, 58, 89–102. doi: 10.1111/j.2044-8279.1988.tb00881.x. Crider, A. (2015). Teaching visual literacy in the astronomy classroom. New Directions for Teaching and Learning, 141, 7–18. doi: 10.1002/tl.20118. Duit, R., & Treagust, D. F. (2003). Conceptual change: a powerful framework for improving science teaching and learning. International Journal of Science Education, 25(6), 671–688. doi: 10.1080/09500690305016. Ernst, H., McGahan, W. T., & Harrison, J. (2015). Questionable benefit of visual and peer mediated learning on overall learning outcomes of a first-year physiology course. International Journal of Mobile and Blended Learning, 7(1), 25–40. doi: 10.4018/ijmbl.2015010103. Francek, M. (2013). A compilation and review of over 500 geoscience misconceptions. International Journal of Science Education, 35(1), 31–64. doi: 10.1080/09500693.2012.736644. García Fernández, B., Mateos Jiménez, A., & Bejarano Franco, M. (2016). Training teachers with a virtual learning community: connecting peers with an international dimension. Pedagogika, 122(2), 124-140. doi: 10.15823/p.2016.25. García Fernández, B., & Ruiz-Gallardo, J.R. (2017). Visual literacy in primary science: exploring anatomy cross-section production skills. Journal of Science Education and Technology, 26(2), 161-174. doi: 10.1007/s10956-016-9662-0. Gomez-Zwiep, S. (2008). 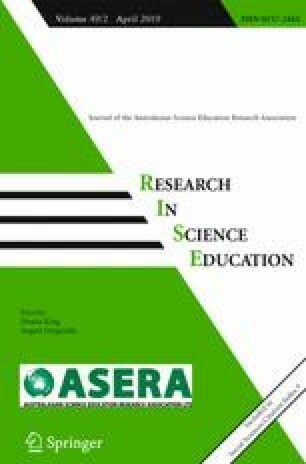 Elementary teachers’ understanding of students’ science misconceptions: Implications for practice and teacher education. Journal of Science Teacher Education, 19(5), 437–454. doi: 10.1007/s10972-008-9102-y. Gönen, S. (2008). A study on student teachers’ misconceptions and scientifically acceptable conceptions about mass and gravity. Journal of Science Education and Technology, 17(1), 70–81. doi: 10.1007/510956-007-9083-1. Gresnigt, R., Taconis, R., van Keulen, H., Gravemeijer, K., & Baartman, L. (2014). Promoting science and technology in primary education: a review of integrated curricula. Studies in Science Education, 50(1), 47–84. doi: 10.1080/03057267.2013.877694. Hand, B., & Choi, A. (2010). Examining the impact of student use of multiple modal representations in constructing arguments in organic chemistry laboratory classes. Research in Science Education. doi: 10.1007/s11165-009-9155-8. Hattwig, D., Bussert, K., Medaille, A., & Burgess, J. (2013). Visual literacy standards in higher education: new opportunities for libraries and student learning. Portal: Libraries and the Academy, 13(1), 61–89. doi: 10.1353/pla.2013.0008. Haug, B. S., & Ødegaard, M. (2015). Formative assessment and teachers’ sensitivity to student responses. International Journal of Science Education, 37(4), 629–654. doi: 10.1080/09500693.2014.1003262. Kindfield, A. C. H. (1994). Biology diagrams: tools to think with. The Journal of the Learning Sciences, 3(1), 1–36. doi: 10.1207/s15327809jls0301_1. Kragten, M., Admiraal, W., & Rijlaarsdam, G. (2013). Diagrammatic literacy in secondary science education. Research in Science Education, 43(5), 1785–1800. doi: 10.1007/s11165-012-9331-0. Krajcik, J. S., & Sutherland, L. M. (2010). Supporting students in developing literacy in science. Science, 328(5977), 456–459. doi: 10.1126/science.1182593. Lee, V. R. (2010). Adaptations and continuities in the use and design of visual representations in US middle school science textbooks. International Journal of Science Education, 32(8), 1099–1126. doi: 10.1080/09500690903253916. López-Manjón, A., & Postigo, Y. (2009). Representations of the human circulatory system. Journal of Biological Education, 43(4), 159–163. doi: 10.1080/00219266.2009.9656176. Magner, U. I. E., Schwonke, R., Aleven, V., Popescu, O., & Renkl, A. (2014). Triggering situational interest by decorative illustrations both fosters and hinders learning in computer-based learning environments. Learning and Instruction, 29, 141–152. doi: 10.1016/j.learninstruc.2012.07.002. Mayer, R. E., Bove, W., Bryman, A., Mars, R., & Tapangco, L. (1996). When less is more: meaningful learning from visual and verbal summaries of science textbook lessons. Journal of Educational Psychology, 88(1), 64–73. doi: 10.1037/0022-0663.88.1.64. McTigue, E. M., & Flowers, A. C. (2011). Science visual literacy: learners’ perceptions and knowledge of diagrams. The Reading Teacher, 64(8), 578–589. doi: 10.1598/RT.64.8.3. Monteiro, A., Nóbrega, C., Abrantes, I., & Gomes, C. (2012). Diagnosing Portuguese students’ misconceptions about the mineral concept. International Journal of Science Education, 34(17), 2705–2726. doi: 10.1080/09500693.2012.731617. Moss, G. (2001). To work or play? Junior age nonfiction as objects of design. Reading, 35, 106–110. doi: 10.1111/1467-9345.00171. National Research Council. (2013). The next generation science standards, appendix F: science and engineering practices. United States, Washington D.C.: National Academy of Sciences. Retrieved from: http://www.nextgenscience.org/next-generation-science-standards. Núñez, F., & Banet, E. (1997). Students’ conceptual patterns of human nutrition. International Journal of Science Education, 19(5), 509–526. doi: 10.1080/0950069970190502. Olmos, S., & Gavidia, V. (2014). El sistema linfático: el gran olvidado del sistema circulatorio. Revista Eureka sobre Enseñanza y Divulgación de las. Ciencias, 11(2), 181–197. doi: 10.10498/15974. Patrick, P. G., & Tunnicliffe, S. D. (2010). Science teachers’ drawings of what is inside the human body. Journal of Biological Education, 44(2), 81–87. doi: 10.1080/00219266.2010.9656198. Reid, D. J. (1990). The role of pictures in learning biology: part 2, picture text processing. Journal of Biological Education, 24(4), 251–258. doi: 10.1080/00219266.1990.9655153. Rodríguez Estrada, F. C., & Davis, L. S. (2015). Improving visual communication of science through the incorporation of graphic design theories and practices into science communication. Science Communication, 37(1), 140–148. doi: 10.1177/1075547014562914. Tang, K. S., & Moje, E. B. (2010). Relating multimodal representations to the literacies of science. Research in Science Education, 40(1), 81–85. doi: 10.1007/s11165-009-9158-5. Uttal, D. H., Miller, D. I., & Newcombe, N. S. (2013). Exploring and enhancing spatial thinking links to achievement in science, technology, engineering, and mathematics? Current Directions in Psychological Science, 22(5), 367–373. doi: 10.1177/0963721413484756. Yeh, H. T., & Cheng, Y. C. (2010). The influence of the instruction of visual design principles on improving pre-service teachers’ visual literacy. Computers and Education, 54, 244–252. doi: 10.1016/j.compedu.2009.08.008. Yip, D. Y. (1998a). Teachers’ misconceptions of the circulatory system. Journal of Biological Education, 32(3), 207–215. doi: 10.1080/00219266.1998.9655622. Yip, D. Y. (1998b). Identification of misconceptions in novice biology teachers and remedial strategies for improving biology learning. International Journal of Science Education, 20(4), 461–477. doi: 10.1080/0950069980200406. Van Duzor, A. G. (2011). Capitalizing on teacher expertise: motivations for contemplating transfer from professional development to the classroom. Journal of Science Education and Technology, 20(4), 363–374. doi: 10.1007/s10956-010-9258-z.